Congratulations on your new baby! Your baby may already be here or you may be eagerly awaiting your child’s birth. The responsibility and wonder you sense is something we want to celebrate with you as you bring your child to the Church for the Sacrament of Baptism. 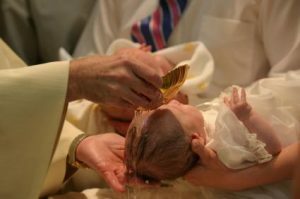 St. Elizabeth Ann Seton Parish provides a session preparing parents for the baptismal ceremony and the responsibilities which baptism entails: this session must be attended before the Baptism. We strongly encourage parents-to-be to attend the preparation session before the birth of your child. The sessions are held in the rectory basement on the first Saturday of each month at 9:15 am. The session lasts approximately an hour. Parents who have never attended a preparation class are not required to attend. Parents should be registered members of the parish and at least one parent should be a practicing Catholic. The choice of godparents is important. Ideally, a godparent will help provide a life-long example of Christian living,encouraging your child in the experience of our Catholic Faith. The godparents should be people whose faith lends itself to this living example. The Church, therefore, requires that a godparent be at least sixteen (16) years old, be baptized, confirmed, and a practicing Catholic. You may, however, wish to choose a witness who is non-Catholic, while this person may not fully share our Catholic faith, this one must be a baptized Christian in order to stand as a witness for baptism. It is customary to choose a godfather and a godmother, although there is no requirement that there be two godparents. Regardless of whom you choose as sponsors at least one of the sponsors must be a Catholic, meeting the above mentioned requirements. For unusual situations that come up with Baptism permission of the pastor is required. Baptisms are celebrated at Saint Elizabeth’s on the 1st & 3rd Sundays of each month at 1:15 pm following the 12 noon Sunday Mass. The date of your child’s baptism will be established after you have completed the Baptism informational sheet and confirmed with parish staff you are a member of the parish. Our parish family is very happy to have a new member already here or on the way—your child will bring new life to you and to our Church. The Baptismal Information Form can be obtained by calling the rectory office at 636.946.6717.